Today i am gonna tell you about the benefits of adding Fuller's Earth powder (Multani Mitti) in your routine. 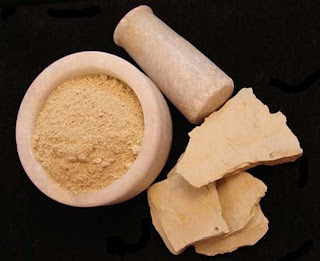 Fullers Earth, commonly known as multani mitti has been in use as a skincare product since centuries. Before cosmetic products became a rage, women in India used home remedies to treat beauty problems like acne, blackheads, scars etc. Though many have now moved on to branded products, these home remedies still work wonders for one’s skin and come relatively cheap, without any side-effects. Fullers Earth is enriched with magnesium chloride which reduces acne and blemishes. Very good for oily skin as it absorbs the excess oil thereby reducing the chances of new pimples. Applying a Fullers Earth face pack cleanses the skin and removes dirt, oil and dead skin cells. Its healing properties reduce redness. Using it regularly will further relieve the skin from acne scars and inflammation. Fullers Earth is also good for getting rid of tanning and pigmentation as it has a soothing effect on the skin. It removes whiteheads and blackheads naturally. Fullers Earth is very safe to use as it does not have any side-effects. If you have oily skin, make a paste of Fullers Earth and rose water with a pinch of turmeric in it – the paste should be thin in consistency. Apply it on your face and neck area, avoiding the area around the eyes. Leave it to dry and then rinse it off with water. Remember, do not talk or make too many facial movements after you apply any face pack. If your skin is normal to dry, mix ground almond paste and replace the rose water with milk in the face pack. If you want to get rid of acne on your face, make a paste consisting Fullers Earth, neem, camphor (kapur) and rose water. Apply it once a week to get good results. To remove blemish and pimple marks, mix Fullers Earth with some freshly squeezed tomato juice. Add a hint of sandalwood powder and turmeric to it and apply the pack on your face. If you have dark spots, add yoghurt and mint (pudina) leaves in Fullers Earth, make a paste and apply it on the spots for half an hour before rinsing it off with lukewarm water. Even if you do not suffer skin problems like acne, scars etc, apply Fullers Earth mixed with some essential oil. This will make your skin smoother and supple and add a glow to it. Fullers Earth has many benefits and one must not ignore its power to heal the skin. Try these homemade face packs and see your skin become radiant than before. The trick to identify real Fullers Earth is by its colour and smell. It is usually of cream to tan colour and has a fresh, muddy odour. You can even buy ready-made multani mitti packs offered by various cosmetic brands. Make sure you add sufficient water in it to paste as it absorbs water very fast and dries quickly.